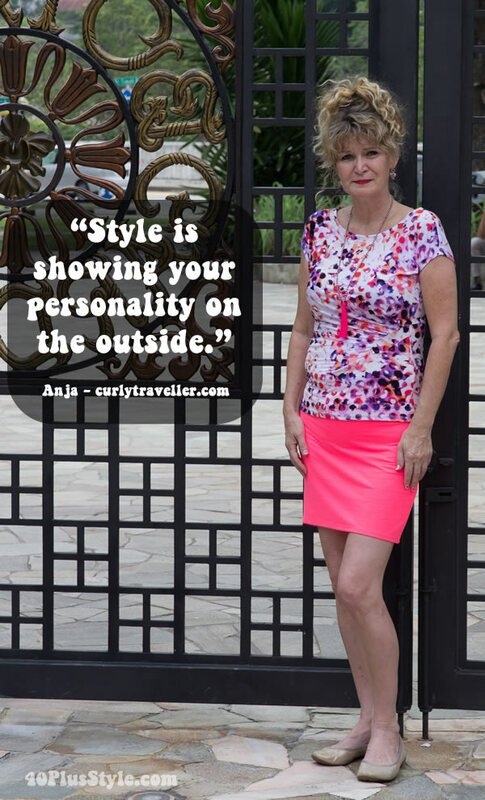 40+ Style » Finding your style » Things bloggers say: what is style? Things bloggers say: what is style? It’s a question that has been asked for decades and perhaps even much longer. I discussed it several times on this website before. In this article, I mention several quotes by famous people, as well as show a video of the incredibly stylish Audrey Hepburn. There are some more quotes in this article, while I offer some tips to find your own style here. I thought it would be great to ask the question to my blogger friends as well, so have a look what they thought in this short video! Now it’s your turn. How would you answer the question: What is style? Great video and quotes from these stylish women (incl. yourself)! “Clothes are a language by which we are judged: a shorthand that allows us to communicate with others, and an expression of our feelings of self-worth and status.” – style editor Jo Ellison. Yes it’s a fun video don’t you think? That is a very well expressed quote. What makes a good fashion blogger? All of YOU! Great little clip and so lovely to hear all of you speaking. I’m always impressed to see your amazing outfits and how you put items together in a stylish way which is uniquely you. You give us all the confidence to be who we are. Nice little video, Sylvia, and good post and topic as well. Anxious to read the comments of others on what style means to them. One question I would like to ask the Bloggers is what they think of ‘Distressed’ or ‘Ripped Jeans’ ~ I personally think it is a dreadful style statement, but would like to know what you all think and why some might find it attractive. I like them “slightly distressed”. If gives off a vibe of nonchalance to me. As if you don’t really care they are not perfect. Of course I would combine them with a very nice blouse / shirt, high heels and the perfect bag. The distressed jeans are only there to make a tension. But as I said… I have one or two pairs of jeans with one or two little rips, so I am not going overboard. I think style is an artistic expression of yourself. I really enjoyed the video. Also liked the way you made this post, with pictures and statements of us. Thank you. It is lovely to see and watch. We did have a great time. Thanks Greetje. I’m such a visual person. Really wanted to make each post look fun and attractive! What a great video – I love that I got to hear all your lovely voices too. Style to me is letting your personality shine through and wear what makes you confident. BTW, I am hosting a link up this Thursday and would love for you to join me. I agree with Suzanne, it is the ability to leave people with the impression I want. Sometimes that may be an expression of one’s personality. As someone who works in a rather conservative, male-dominated profession sometimes boundary-breaking means I need to dress in a way that allows people to be confident that you can do the task at hand. I will be 50 this winter. I honestly look & feel early 40’s. I wear a very modern long hair style with heavy bangs. I’m 5’8 and wear a size 4. I am realizing I can no long dress like I’m in my 20’s. Yet I don’t want to dress like an Old lady. I’m lost. I do feel I can wear a lot of things most women my age can’t. I was a daycare provider for 9 years. Sweats and jeans is all I wore. I now work one hour everyday at the church and have to look nice & tasteful. I want to dress appropriately while there, yet still keep in touch with my cute and modern self at the same time and not look 20. I do not like to wear heels, they hurt my back & make me too tall. Can u help? Hi Lisa I have written many articles on this topic so I would suggest just to browse through them. There are no clear rules of what you can and cannot wear. I have provide some very general guidelines here https://40plusstyle.com/how-to-dress-after-40-and-still-look-hip/, but these are not set in stone. You will need to find out what works for you and in which clothes you feel comfortable. You can basically wear anything so long as you wear it with confidence. Good luck! Great post and love the comments, especially the ability to pull your tummy in! I agree though that style comes down to confidence and the ability to reflect how you feel about yourself and the world through your style. Love your blog!